This week’s training was more of the same – running and strength training – so nothing new to report, but let’s take a look at last week’s workouts. 3 mile run and 70 tricep dips. I was feeling SO inspired by all of the awesome Boston Marathon runners so I had to rock all the blue and yellow for my run after work! 3 mile run + Body Works + Abs class (45 minutes) + 70 pushups. The DOMS was real after this workout! I spent some extra time with my foam roller after class and also did some extra stretching. Peleton scenic ride (30 minutes) + 70 jump squats. I had to go to an event at 5:30 Wednesday evening so I had just enough time to come home, get in this workout, shower and then drive downtown for the event. I missed my normal boot camp class, but I was happy to get in some type of workout for the day. 5 mile run + 80 tricep dips. This run felt pretty good but my arms were jelly after all of those tricep dips! REST DAY! This was my first rest day in 2 weeks and I took full advantage of doing absolutely nothing! 10 mile run + 80 jump squats. Luckily this run went WAY better than last week’s long run. The weather was cooler so my allergies weren’t as crazy, thank goodness. I felt great for most of the run but my legs felt a little heavy during the last 2 miles. The Saturday morning run crew is getting larger and I couldn’t be more happy about that – I love introducing people to running! The Sunday instructor was out of town today so we had a sub and she taught a boot camp class instead of body works + abs. It was a really great class and I definitely got my sweat on! No spinning today as my legs felt so tired after yesterday’s run and the boot camp class. Another good week of training. I feel like that past two weeks of training have been some of my strongest during this training cycle. I can already see that dedicating more time to strength training is starting to pay off! Speaking of hard work paying off, did you watch the Boston Marathon? I tip my hat to all of those runners. Those running conditions were absolutely horrendous! You don’t really see these phone alerts too much in New England.. Even the Elites had a hard time on Monday. There were more dropouts than usual. I have no clue how the runners braved those elements but they all have official badass status in my book – WAY TO GO RUNNERS! I’ve actually never had a desire to run the Boston Marathon but now I think I would like to run it eventually. Of course I’d have to do this as a charity runner as I’ll never qualify, unless I’m still running at 80 years old, LOL. Were you inspired by the Boston Marathon? Are you currently training for any races? I’m sharing my thoughts on Boston in a blog post Tuesday. But I find it interesting that very US elites dropped out but the Ethiopian/Kenyan ones did. I think they realized they weren’t in contention for a paycheck and just bagged it. Not sure how I feel about that! But the US women are tough!!! Looking forward to your post tomorrow! I read one article that said some of the Elites may have dropped out because they didn’t want a “slow” race time on their records. I really hope that’s not true! How could you not be inspired by Boston?! And I loves those blue + yellow socks – perfect! Great week for you. 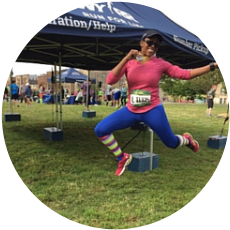 I need to get my mileage up for the Denver Half – I think it’s the same weekend …. I read an interesting article on why more men dropped out than women. Women are extra tough, right? 😉 I’d have to improve a few minutes and age about 15 years to qualify. LOL. That won’t happen. Nice to hear your training is going well and you’ve got a great weekend group to run with. Thanks for linking. Ooh those yellow shoes are super cute! you look so happy after your 10 miler! Nice job you. Are you doing the 8K and the half? Thanks! I’ve got a few more runs in those yellow sneakers and then I’ll have to retire them 🙁 I love them so much though! Yup, I’m doing both the 8K and Half Marathon during the Cleveland Marathon race weekend. The 8K will be that Saturday and the Half on Sunday. The race was so awesome! I was definitely inspired. Looks like you had a great week! I’m excited to see how your race goes after so many strong weeks of training. It’s a week later and I’m still super inspired by the race! I think it’s something that will stick with me for a long time. That list is incredible. I knew there had to be a lot of dropouts since so many East Africans weren’t in the top 10. I really wondered what happened. I don’t blame them. It’s so easy to get an injury in that kind of race and be out for a while. I was also really amazed by that list! I guess it goes to show how bad the weather was that day. I was so inspired by the marathon that I stayed up until 1AM watching it from Hong Kong 😉 Love how you rocked the marathon colors. I do that too! Your Saturday morning group makes me happy. Group runs are the best! Wow that’s awesome Amy, I don’t know if I could have stayed up that late to watch the race! Boston totally had my head spinning with all kinds of inspiration! I totally cannot imagine running 26.2 miles in those extreme conditions, though. I know it’s Boston and all, but it would be a bummer to put in all the training and expense to get there, and then have that kind of weather to fight for the entire race. Badazz all the way! I still can’t wrap my head around how those runners were able to run in those conditions! It is insane how the weather took a toll on everyone, but so many recognizable names didn’t finish. Kudos on your great week! Nice job this week – I am tired just reading about 10 miles + 80 jump squats! I was super inspired by the Boston race too – I am of course so happy for Des, and I’m also loving leaning about runners such as Yuki and Sarah Sellers. Thanks Sarah! I agree – I was so happy for Des and Yuki, but also for the other runners that came in top 10, many of which were unknown to many. I love that your running crew is getting bigger! This Sunday I had a 19k run to do so I spread the word and we went from being just 2 people to 6! Feels so cool to get people out there and running, whatever level they are at. Plus getting out of bed is a little bit easier when you know you are meeting people! That’s so awesome that you were able to run with others for your long run yesterday! Great job with your training this week! I missed watching Boston and I’ve been so busy, I haven’t had time to catch a replay. Thanks Sara! I hope you get to watch the Boston Marathon race soon – it will definitely put a smile on your face! I was streaming the marathon at work and no one at my office understood my excitement when she won…they didn’t even know who she was 🙁 But oh well, I loved it! Great week of training for you- I love that your running group has grown too! Do you all run together? LoL no one at my office understood my excitement either – hahaha. For the group runs we normally start them together but then we all run different paces. We end up meeting up at the end to recap or runs,etc. It’s really nice! I think it’s fairly customary for elites to bag a race like that when things go very pear-shaped, although I think all but Kastor were pretty far into the race before they quit so I’m not sure what the point was. I think Jordan Hasay had the right idea with a DNS to be honest. Great week for you! I love that you have fun socks for every occasion! I agree. I think I would rather have a DNS vs a DNF. I’m also not quite sure why so many of the Elites pulled out when they were so far into the race. I read an article that said maybe the Elites didn’t want a “slow” finish time on their records so that’s why they pulled out, but who knows! That’s quite a DNF list. Actually, I don’t blame elites for quitting when they don’t have a chance to place. This is their career, after all, and marathoning takes quite a toll on the body. Good for the Americans that stuck it out! It really was quite the list and I found it interesting (but not surprising) that more men dropped out than women. Very inspired by the Boston Marathon – specifically the top three female winners (3rd being a Canadian – whoohoo). I have a good case of DOMS today in my thighs from my long run yesterday – not loving stairs at the moment! I was so impressed by the top 10 list this year! It was nice to see some new names on there and I love learning about new runners! Glad to hear you had another strong week! I know all that upper body work would have had me crying, lol! it’s great when you have a running crew, even better when it grows and you’ve got more people to enjoy running with! I don’t think I’ll ever run Boston…I definitely won’t qualify for it LOL. I’d consider charity but probably in about 15 or 20 years haha! /Oh this arm work is killing me, but I’m enjoying it – does that make sense? LOL about Boston! It was one race that I never cared to run until Monday! I just love seeing all the determination and grit! Right?! I just love seeing more and more people interested in running. Warms my heart! So I’m not the only one who got a sudden desire to run Boston after last Monday? Lol good! I’m going to try and qualify because I think if I work hard enough I can, but I’m not sure. Doesn’t hurt to try though does it? You are so dedicated to your training esp cross training. I wish I were. Yes, I was so inspired by those that braved those conditions. I felt bad for anyone who will BQ once in their lifetime. Thanks Darlene! I actually really enjoy cross training so I try to make it a priority when I can. What a great week of training. You are on track for an awesome race! I’m with you on never qualifying for Boston. Right now I can qualify as an 85 year old woman! I don’t foresee dropping a full hour off of my time! LOL, yes it doesn’t look like getting a BQ for Boston is in our future but that’s okay! Boston was just epic this year! So much respect for everyone who made it to the finish line…and Desi was amazing! SO much respect to those runners!! Great job this week! I’m so glad your allergies have calmed down. They are always so miserable. I can’t even imagine what those poor runners had to deal with out there last Monday. I can’t say I would have wanted to be out there. But kudos to those who gutted it out! They are truly so amazing! I was there watching the Boston Marathon and had tears in my eyes as Desi passed. She looked incredible and those conditions were bananas! Solid week of training, I’m continuously impressed by your tri dips! Desi looked amazing out there! I felt so bad for her when they interviewed her after winning because she was shivering so bad. I wanted someone to give her a bunch of dry clothes to help warm her up! I really was inspired by those Boston marathoners. I was visiting the Boston area on that Monday and the weather really was horrible, you did NOT want to be outside. I was thinking about the runners all day, anyone who finished deserved a medal for grit. As for you, I’m proud of you for training so well these last two weeks with only one rest day! I’m glad you have that much stamina. And I’m glad to hear that your strength training is paying off. Yes – you should tots run Boston. It’s amazing!! Yup, I definitely added Boston to my bucket list! Wow, only one rest day over the course of two weeks. You’re a very dedicated rock star! Yes that was a total mistake, I usually do one rest day per week, lol.